Discussion in 'How To Section' started by 5150 pops, Nov 7, 2018. Reserving this spot, as the good people came through. I will hopefully have a complete video clip finished, and a link posted by Monday Nov.12, '18 in this thread. For now, I give you a couple pics of the damage free box, and mega excellent packaging, has me excited. Surprised the box is as big as it is, there must be even more fill inside the Honeywell box! Standard wheelbase '18, and it just barely made inside the hatch with only the 3rd row folded flat. HawkX66 and mquick5 like this. BTW, they sent it out, "signature required," which I wasn't counting on. I only found that out, when I tracked it, Sunday. Tried to reroute to FedEx office, but it said that it required the shipper to change. Thankfully, sent a message to them through eBay, to which they took care of the change, and it didn't change the delivery date, even though FedEx had told them it could result in a delayed delivery of the following Monday. Here is a link to 6 somewhat short clips, as promised. I'll add more to this eventually, but at present, I need a break from the computer screen. Overall very happy, with the outcome, I do wish I had recorded a bit more of what I did to make life easier on myself, as I was working from ground level, again with 2 solid cinder blocks under both front tires for added clearance. No assistance utilized during this process, but certainly an extra set of hands would be welcomed raising the Garrett unit into place, and holding in place as bottom support brace is reinstalled. I used my knees while lying on my back, under the vehicle. Yes envision knees to chest, while on your back, and one of your free hands maintaining level of cooler while threading bolt on each side, followed by tightening bolts with ratchet. This is my first foray into posting to YouTube, obviously lots of room for improvement. Here are links to live Intake Air temp via OBD vs Ambient temp displayed in dash. Isomnia sometimes leads to productivity. I "see" now, why I had a problem installing my Garrett CAC that was specifically designed for the F-150. I took the risk so you don't have to, and am now updating the thread for clarity. It does indeed appear the lower grille shutter assembly is different (at least on the 2018 Expedition, didn't bother to check against prior m.y. expys cuz, I have '18, lol). According to Garrett's instructions, if you "peel away/unsnap and remove" the following piece (highlighted in green) with a pick tool, it provides the necessary clearance to mount the new CAC. A side benefit of this is of course the grille shutter module is still attached to the main housing. 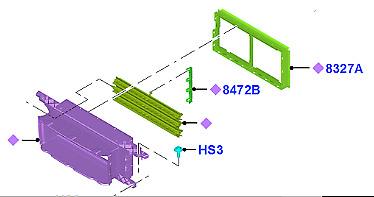 This is true if you have grille shutter assembly JL3Z8475B. My grille shutter assembly on the 2018 Expedition is JL13Z8475B. It is just a weeee bit different, as I mentioned before, it doesn't have an additional removable frame. As I said before I don't regret, taking the plunge, buying something that was not proven to fit on an Expedition, but I'd thought I'd provide further explanation for anyone who may be "on the fence". This additional information hopefully will provide confidence to go forth either to move on to something else, or take the plunge. I would caution, that if all Expedition's or at least all 3.5 Ecoboost equipped Expedition's use the exact same shutter assembly as mine, the probability of using a different aftermarket CAC will likely present the exact same challenge, as is present with the Garrett. I knew the upper shutter assembly was different between F-150 and Expedition, but now I have my confirmation for the lower too. One glaring difference in the upper assembly, there are two air duct openings at the top of the housing assembly that helps feed cold fresh air diverted from the shutters being closed, up to the front portion of the hood, that channels additional air to the factory airbox. Expedition owners get screwed, LOL. 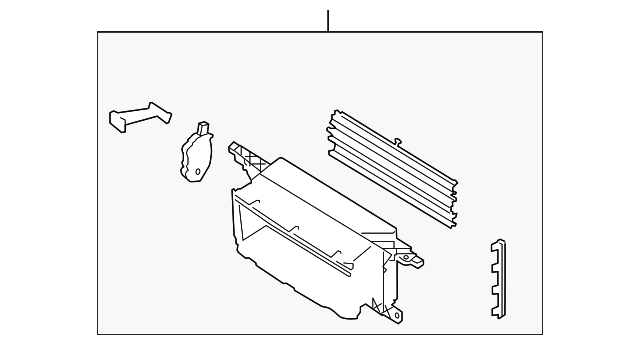 The upper portion of the grille assembly for Expedition does not have these two openings.